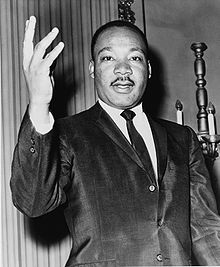 View Martin Luther King, Jr. and over 3,000,000 other topics on Qwiki. He was involved in the boycott against transit system (Rose Parks incident) in 1955 and becomes unofficial leader of the black protest movement which were peaceful demonstrations. He followed Gandhi's pacifism and civil disobedience and was a powerful speaker (gained support through his speeches). The blacks gained sympathy when they were showed being beaten by the police on T.V. (didn't fight back). His "I have a dream" speech most famous made during March on Washington in 1963 and won a Nobel Peace Prize in 1967. But he was assassinated in 1968 during a speech.